Which Science Fiction Story Could Have Gone In A Much Darker Direction? Lots of science fiction and fantasy stories like to flirt with real darkness — showing heroes who cross the line occasionally, or situations that have no right or wrong answer. But then they usually return to the path of lightness. Which story missed out on the potential to go to a really dark place? Please include a picture, poster, clip, book cover, comics panel, or other visual representation of your chosen story. And please mention the name of the story, how it could have gone a lot darker, and why that might have been better. Thanks! Top image: Star Trek: Deep Space 9, “In The Pale Moonlight.” This story came up yesterday in the article about TV episodes that resolved huge philosophical questions, and I found myself wishing that it had had more impact on the series as a whole. 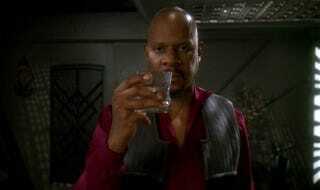 What if this was just the start of Sisko making more and more ethically questionable decisions to win the war? Also, how would that affect his status as the Emissary chosen by a race of timeless wormhole aliens — could you still be the chosen one if you had crossed too many moral lines?